You may have already known that sign languages are a unique way for the Deaf communities to communicate. However, do you know that different countries and regions have different sign languages? 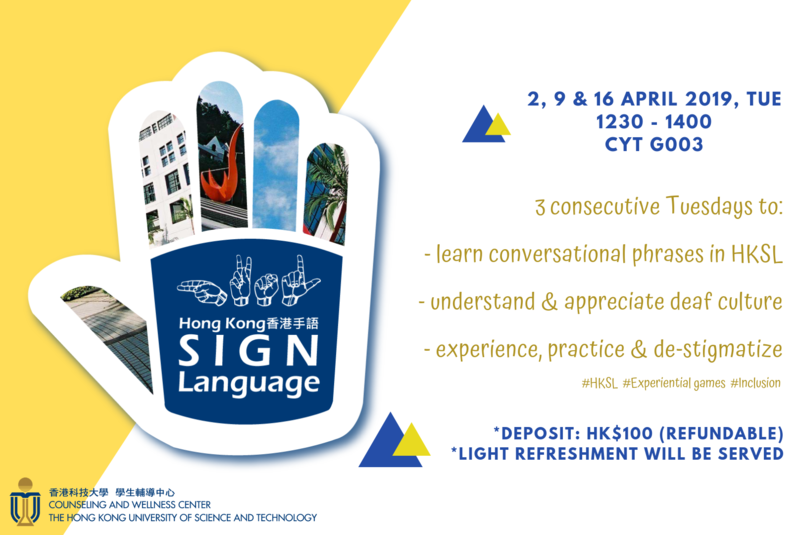 As an extension of the SEN Pop-Up!, we are pleased to invite you to a short course about Hong Kong Sign Language (HKSL) and Deaf culture that can equip you with useful conversation phrases and signs when interacting with Deaf people. Light refreshment will be served. Participants are strongly encouraged to bring their own cups for a free drink (coffee, tea or chocolate). Students, faculty and staff members are all welcome! Can Deaf people drive? Do they read lips? What else do you want to ask Deaf people? What’s so unique about the Deaf community? A Day to Remember – What is the life of a Deaf person in Hong Kong?